Lombard, Illinois based Conversion Strategies, Inc. recently issued useful tips and guidelines that will enable doctors to attract a steady stream of patients through the use of effective SEO marketing strategies. Patient’s satisfaction is the true measure of a successful medical practice. However, attracting new patients is a lot more difficult nowadays due to a very crowded medical and dental marketplace. With tens and even hundreds of healthcare providers in the same city or state, finding a way to connect to patients requires a whole lot more than just using traditional marketing tools such as word of mouth and distribution of medical pamphlets. “Looking for the best local SEO services is one way of moving ahead from your competitors. Nowadays, patients normally use search engines in finding the best medical and dental practitioners nearby. With this, it is very important to place your business at the top of those searches,” says David Mulcahy of Conversion Strategies, Inc.
SEO is a very effective marketing tool in attracting potential patients and clients. According to studies, SEO also has a better ROI when compared to the conventional use of media such as TV and print advertisements. Due to the rise of the internet, patients now prefer utilizing search engines like Bing and Google in looking for reliable medical and dental clinics. “Through the use of SEO, you can effectively place your business on the map and achieve better visibility, customer traffic, branding and reputation building as you attract more and more patients,” says Mulcahy. Generally, Conversion Strategies, Inc. recommends making separate listings for the clinic and doctors or dentists that see patients at that clinic. In addition, the choice of proper keywords also matter. Using generic words like “dental clinic” for the clinics listings and more specific terms, such as “cosmetic dentist”, “orthodontist” or “endodontist” for the doctors to diversify rankings for your clinic. “Increasing online visibility is the key to a successful business in this day and age. Finding the most effective SEO strategy for doctors will enable them to thrive in the cut-throat medical industry. Complacency and foregoing the importance of online branding is a perfect recipe for business disaster and we are here to prevent that from happening,” he added. 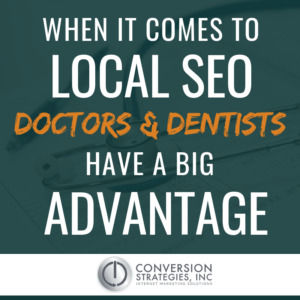 According to Mulcahy, SEO is also very important to doctors because it improves their clinic’s credibility through clients reviews and recommendations. It also reduces patient acquisition costs while attracting more customer traffic which translates to more clients and better profit. Conversion Strategies, Inc. is considered as one of the top SEO service providers in Lombard and the surrounding areas. They have been helping local businesses grow by using their years of experience in providing effective online marketing solutions. More information about Conversion Strategies’ services can be found on their website at www.conversionstrategies.net. Clients may also connect with David Mulcahy and his team through their official social media accounts on Facebook, Instagram, Twitter, LinkedIn and Google+.